PAVILLON DE L’ESPRIT NOUVEAU: A 21st-Century Show Home, a recent exhibition at the Swiss Institute Contemporary Art New York, was a home-furnishing show in homage to Le Corbusier’s seminal temporary pavilion of the same name, which the Swiss-born architect designed for the 1925 Exposition des Arts Décoratifs in Paris. But the pavilion’s 2015 iteration also harks back to another significant moment in the history of Modern architecture: Sigfried Giedion’s book Mechanization Takes Command (1948), a 700-page effort to assemble what the architecture historian called the “anonymous history” of the time. Beyond the museums, villas, and grand urban plans that by the mid-20th century had become emblematic of a modern architecture, Giedion was concerned with the chairs, tables, beds, bathtubs, and kitchens — the objects that more immediately organized quotidian life and increasingly shaped the way humans engaged with the world. Though the mechanization of the household in the mid-19th century signaled the advent of a “servantless” gentry in Europe, critically, for Giedion, the mechanization of objects and systems that surround us indicated a broader, more essential shift in the manner in which humans live. As assembly lines replaced artisans, and as pastures made way for feedlots, the world we live in and the world we imagine began to align. “Mechanization is the outcome of a mechanistic conception of the world,” Giedion observed. In this way, we inhabit and perpetuate a cycle. The Industrial Revolution and the subsequent increasing mechanization of daily lives was as much an entry into modes of efficiency, expediency, and excess, as it was a cycling of machine logic into human processes. Neither good nor bad, for Giedion, “mechanization is an agent, like water, fire, light. It is blind and without direction of its own.” In scrutinizing the machines around us, we get to glimpse the disposition of the self-perpetuating systems of our own creation through which our “anonymous history” becomes individually authored and subjectively hewn. In this household scenario of 24-hour self-observation and digital transportation, the most private places can also become the most public. In a recent essay entitled The Century of the Bed, architecture scholar Beatriz Colomina argued that “the city has moved into the bed,” citing a 2012 report from The Wall Street Journal which claimed that 80 percent of young New York City professionals regularly worked from the place usually designated for nighttime sleeping. As distinctions between work and play erode and a machine logic of “24/7 capitalism” (to paraphrase historian Jonathan Crary) sets in, so do the boundaries of our homes dissipate. “Networked electronic technologies have removed any limit to what can be done in bed,” Colomina continues and, as if relegating us to the isolating expanses of a digital desert, she concludes that “new media turns us all into inmates, constantly under surveillance, even as we celebrate endless connectivity.” Though none of the objects in the Swiss Institute show feature the interactive touchscreens or Internet connectivity one finds in the latest home appliances, all of them were produced through some sort of digital means. At the center of the exhibition is a bed, a ritual place of rest where our bodily needs are confronted with the contemporary need to be always on. Made from a grid of welded wire mesh coated with ChromaFlair iridescent paint, 4 Poster Bed by RO/LU has the spatial demeanor of Sol LeWitt’s boxes, or Superstudio’s Continuous Monument — a sense that space flows in structured yet unimpeded ways, an effect amplified by the gridded canopy’s mirrored ceiling. In this 21st-Century Show Home, nature and artifice, individuals and their surroundings, are in communion in ways that seem to bypass the challenges raised by Colomina and Crary. In any case, for many environmental philosophers today, the nature and artifice duality is itself artificial and not particularly useful for forging ways ahead. What surrounds us, be it mechanized objects, or trees, valleys, and sunsets, exists equally within what we call our environment. Even without a green screen, the great outdoors is the great indoors. 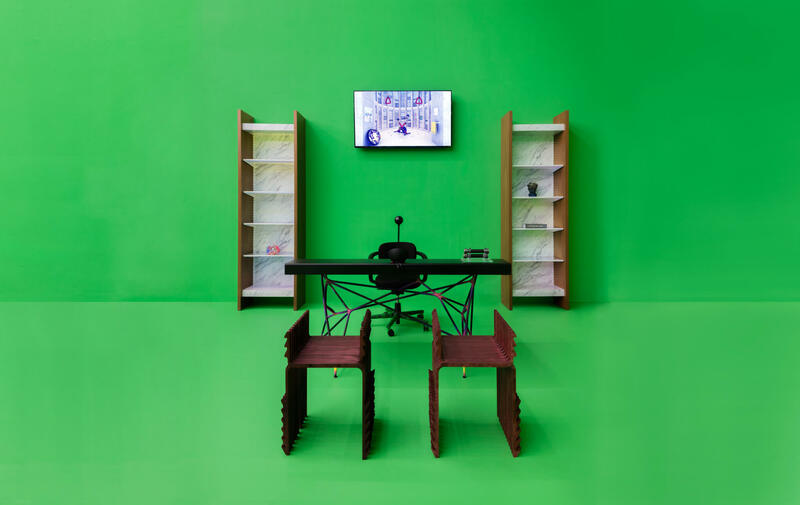 Both Giedion’s study of furnishings as well as the Swiss Institute show point to the fact that we constantly need to reassess the way we engage with what surrounds us. As our environment changes, so too does the anonymous history need to be rewritten. “We must establish a new balance between the individual and collective spheres,” Giedion exhorted at the end of Mechanization Takes Command. “There is no static equilibrium between man and his environment, between inner and outer reality.” In other words, what we design around us are attempts to model larger, even global, systems. In that sense, according to Giedion, Le Corbusier’s original pavilion design “was not merely [the architect’s] protest” against design as decoration; the components of its interior — each table, vase, chair, or carpet — were words that could recombine into new sentences. Conceived as a whole, “it was at the Pavillon de l’Esprit Nouveau […] that one first saw [the interplay of heterogeneous elements] clearly and consistently expressed.” And as if bestowing to furniture and household items a larger, connected sense of purpose, Giedion concludes that “it is time that we become human again and let the human scale rule over all our ventures. PAVILLON DE L’ESPRIT NOUVEAU: A 21ST-CENTURY SHOW HOME WAS CURATED BY PIN–UP EDITOR AND CREATIVE DIRECTOR FELIX BURRICHTER, WITH EXHIBITION DESIGN BY ARCHITECT AND ARTIST SHAWN MAXIMO. IT FEATURED WORKS BY LINDSEY ADELMAN, NANU AL-HAMAD, ARANDALASCH, ALESSANDRO BAVA, JOSH BITELLI, CAMILLE BLIN, LAURELINE GALLIOT, KONSTANTIN GRCIC, PAUL KOPKAU, KRAM/WEISSHAAR, JORIS LAARMAN, MAX LAMB, LE CORBUSIER, PIERO LISSONI, PHILIPPE MALOUIN, SHAWN MAXIMO, JASPER MORRISON, JONATHAN MUECKE, MARLIE MUL, IFEANYI OGANWU, LEON RANSMEIER, SEAN RASPET, JESSI REAVES, GUTO REQUENA, RO/LU, ROSSI BIANCHI, JULIKA RUDELIUS, SOFT BAROQUE, ROBERT STADLER, IAN STELL, KATIE STOUT, ELISA STROZYK, STUDIO DRIFT, PATRICIA URQUIOLA, CHRISTIAN WASSMANN, AND BETHAN LAURA WOOD.